Classical Education recognizes that a child’s brain develops in stages and seeks to utilize each stage of cognitive development to promote mastery. SSCCA’s curricula, following the classical Trivium, is divided into three stages of learning: the Grammar Stage (PreK – 6), the Logic Stage (7-9) and the Rhetoric Stage (10-12). 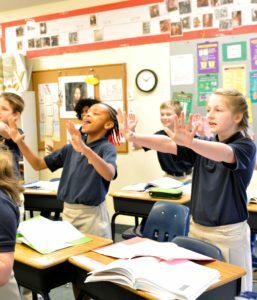 In the Grammar Stage (elementary school years) when children easily memorize information, SSCCA students focus on math facts, Bible and history chronology, Latin endings, and the rules of spelling, phonics, and English grammar. Through recitation, chanting, song, and modeling, children at SSCCA learn a wide body of information as they master core subject matter. In addition to traditional studies in arithmetic, reading, and writing, students are immersed in the history of mankind as they follow ancient civilizations from the Egyptian Empire to the rise and fall of Rome. From the Middle Ages to the Explorers and the founding of America, SSCCA students help make history come alive as they create art projects, living ‘wax museums’, and participate in feasts donning period costumes. As they enter into the analytical or Logic Stage (middle school years) of learning development, students at SSCCA study algebra, science, English composition, the Great Books of Western Civilization and Christian Tradition, Latin, and logic. SSCCA students graduate from our upper school primed for success in high school and beyond. St. Stephen’s Classical Christian Academy has been a blessing to our family in many ways. Our three sons (two of which are now in college and one in an all boys private school) have thrived in the classical approach to education and it has helped them transition beautifully into high school. We have even found that the educational standards and rigor of the curriculum have many benefits as they have headed into college.